Church – Who were they? 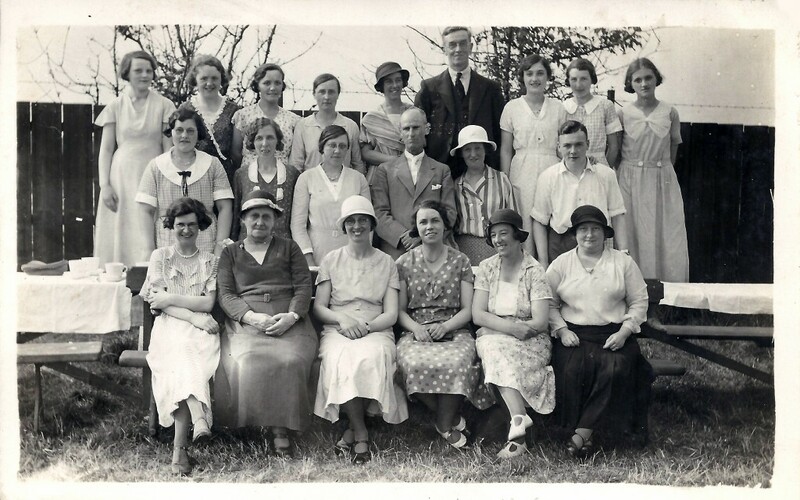 Group from South Durham Street Chapel, c. 1930. Back row: unknown, unknown, Gertie Stevens (nee Linfoot; ALL’s sister), ? Whittaker, unknown, Fred Waggott, Sheila Linfoot?, Dorothy Wiseman, Moira Linfoot. Middle row: unknown, unknown, ? Whittaker, Billy Stevens, unknown, unknown. At church in Sunderland, we happen to know one or two of the families, such as the Whittakers and the Waggotts, who were still around in the 1940s, and ministers such as Messrs Chadwick and Blott were still being mentioned occasionally at that time; but some, such as Blaikie (or Blake), though often mentioned, are merely uncertain names, while others such as Mr Eaves are known only as having preached or died, or both. Miss Inwood was 18 in 1915, 7 years younger than ALL, and he may perhaps have felt more like an elder brother than a potential boy-friend – he went back to see the Inwoods in Sheffield at the end of November 1918 – though there is a suggestion that she may not have seen it quite that way. However that may be, no more is known about either Miss Inwood or Miss Mack.